Estimation of hydraulic parameters in coastal aquifers is an important task in groundwater resource assessment and development. An attempt is made to estimate these parameters using geoelectrical data in combination with pore-water resistivity of existing wells. In the present study, 29 resistivity soundings were analysed along with 29 water samples, collected from the respective dug wells and boreholes, in order to compute hydraulic parameters like formation factor, porosity, hydraulic conductivity and transmissivity from coastal region of north Sindhudurg district, Maharashtra, India. The result shows some parts of the study area reveal relatively high value of hydraulic conductivity, porosity and transmissivity. Further, a negative correlation is seen between hydraulic conductivity and bulk resistivity. The hydraulic conductivity is found to vary between 0.014 and 293 m/day, and the transmissivity varied between 0.14 and 11,722 m2/day. The transmissivity values observed here are in good correspondence with those obtained from pumping test data of Central Ground Water Board. These zones also have high aquifer thickness and therefore characterize high potential within the water-bearing formation. A linear, positive relationship between transverse resistance and transmissivity is observed, suggesting increase in transverse resistance values indicate high transmissivity of aquifers. These relations will be extremely vital in characterization of aquifer system, especially from crystalline hard rock area. Formation factor, porosity, hydraulic conductivity, transmissivity are vital to describe subsurface hydrology. Integration of Geoelectrical and geochemical data can be adopted to study the aquifer parameters. Bulk resistivity and hydraulic conductivity revealed negative relation due to granitic gneiss and laterities. 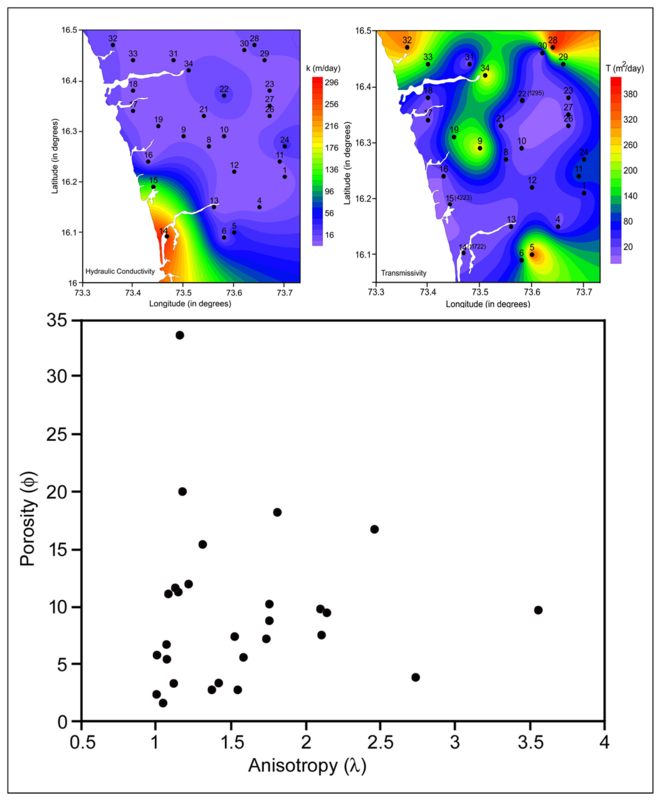 Positive relation between transmissivity and transverse resistance suggest prospective aquifer zones. Spatial variation of transmissivity reveals a positive correspondence with hydraulic conductivity. Analogy between anisotropy and porosity suggests portrays differing extent of saturation zones.